Total Earnings / $88.74 bil. Total Retail Sales / $61.9 bil. Long anchored by NASA and the Kennedy Space Center, Florida’s Space Coast is today attracting private commercial firms in all aerospace sectors, from launches and manufacturing to research, facilities maintenance and servicing. MELBOURNE/ORLANDO Aviation-defense firm Thales is expanding with a target of 500 net new jobs by 2021. Headquartered in France, Thales is a global leader in the aerospace, transport, defense and security markets. TITUSVILLE/ORLANDO A significant presence in East Central Florida for 60+ years, Lockheed Martin is once again expanding here, creating up to 800 jobs at its Astrotech Space Operations site in Titusville and Missiles and Fire Control plant in south Orlando. And coming soon: about 300 Lockheed jobs from California to support testing and maintenance work for the U.S. Navy’s Trident II D5 Fleet Ballistic Missile. 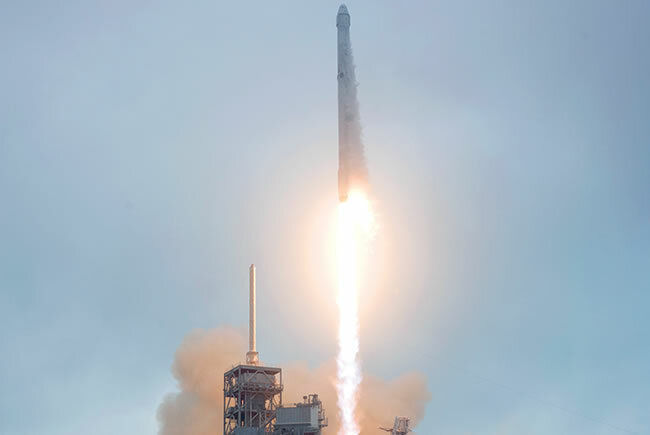 • Elon Musk’s SpaceX plans to build a hangar south of its Cape Canaveral launch sites, where recovered rocket boosters will be prepped for reuse. • OneWeb Satellites broke ground in March 2017 on its estimated $85-million facility at Exploration Park near Kennedy Space Center; satellite production and testing are slated to begin by the end of 2017. • Blue Origin, the rocket company created by Amazon founder Jeff Bezos, began site preparation in February 2017 for an orbital launch complex and rocket engine test stand at Cape Canaveral Air Force Station; a manufacturing and assembly plant for the rockets that are expected to fly by 2020 is under construction at Exploration Park. MELBOURNE AeroMod International, the leader in aircraft maintenance, modification and repair services, relocated its headquarters from Detroit to Orlando Melbourne International Airport and created 150 jobs; another 100 jobs are expected in 2017. MELBOURNE Harris Corporation has opened a new Global Innovation Center at its Melbourne campus to showcase technologies the Florida-based firm has developed for the military, first responders and commercial airlines. TITUSVILLE Brazilian aircraft manufacturer Embraer opened its $3.5-million Aero Seating Technologies manufacturing facility in September 2017.